Happy almost Christmas, my friends! I can’t believe we’re just days away now – the month’s gone by so quickly. Are you ready for the holidays? Got all your shopping done, all your presents wrapped and all your dinners planned? Yeah, me neither. 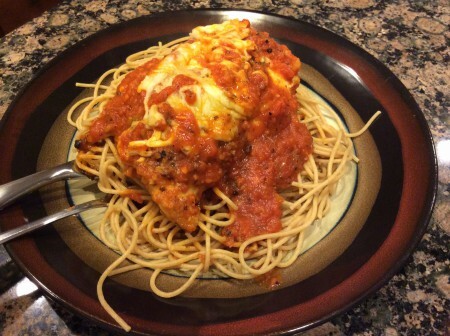 But I do have a great new recipe that’s easy and very decadent: chicken parmesan. 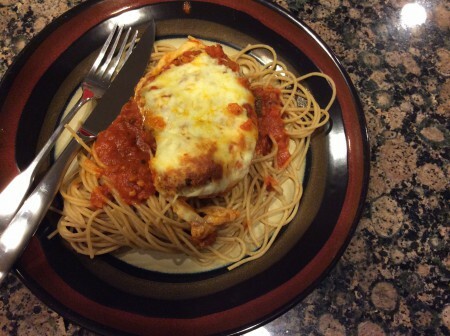 Yes, indeed, chicken parmesan: the classic comfort dish of most people’s childhoods. I don’t have any Italian blood I’m aware of, but even so, my mom makes a mean chicken parm. As much as I’d love to claim this is her recipe to a “t,” it’s not quite. To be honest, her recipe always intimidated me growing up – it was so darn good and looked like it had too many steps to be easy. Well, I finally decided to roll up my sleeves and try making chicken parmesan myself for this blog post. Innovative cook that I am, I took a few shortcuts in the kitchen to make it quicker, easier and better suited to my boyfriend Sean and I. The idea’s the same, the execution is just a little different. Trust me when I say this, though: this chicken parmesan is going to fill you up right. It’s cheesy, it’s saucy, it’s rich and served over spaghetti it’s magnifico! Prepare the pasta according to the box directions, drain and set aside. Preheat the oven to 375 degrees Fahrenheit. Spray a baking dish with non stick spray and set aside. Pour the canola oil into a large skillet on the stove top and heat the oil on medium heat. Beat the egg in a small bowl, and mix the breadcrumbs with the Italian seasoning then pile them up to coat the chicken breasts. Sprinkle the chicken breasts with salt and pepper, then dip each one in the egg wash then dip them in the breadcrumbs and seasoning, pressing firmly to coat entirely. Once the chicken breasts are coated, gently place them in the hot skillet and cooked for 8 – 12 minutes, until the chicken is cooked through, turning occasionally to brown each side. After the chicken’s cooked all the way through, lay it in the greased baking dish, pour the red pasta sauce over all the chicken and sprinkle the whole thing with the shredded Italian cheese blend. Bake in the oven for 20 minutes until cheese is totally melted. Serve the chicken breasts over a helping of spaghetti and spoon extra marinara sauce from the baking dish onto the pasta. Optional: Sprinkle parmesan cheese over it all and eat up. Behold the cheesy, chicken-y goodness awaiting you. Dinner’s ready – and it’s delicious. This post is part of the monthly link up party Our Growing Edge. This event aims to connect food bloggers and inspire us to try new things. This month is hosted by Christine and Kath from Garden Eats. 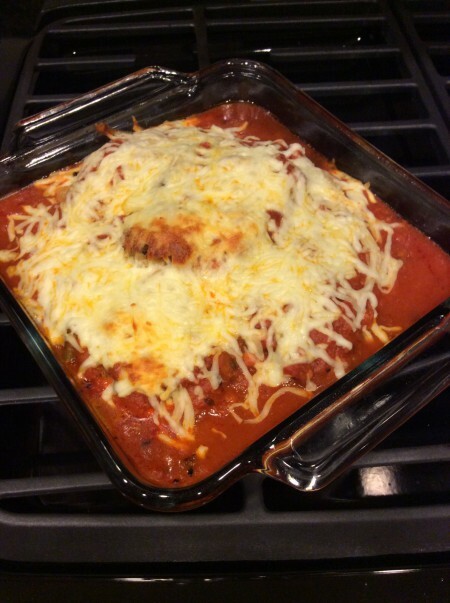 This entry was posted in Entrees, Recipes and tagged Chicken, Chicken Parmesan, Chicken Parmesan with Spaghetti, Entrees, Marinara, Parmesan, Recipes, Red Sauce, Spaghetti on December 21, 2014 by Paige N..